Leading web video distribution and analytics company TubeMogul recently launched TubeMogul 2.0 which "democratizes video metrics" by providing free video tracking capabilities that were once exclusive only to large media companies and advertisers. TubeMogul's powerful InPlay technology, incorporated into their platform from their acquisition of video analytics firm Illumenix, was previously only available to sites hosting their own video, but is now integrated on 15 of the Web's top video sharing sites, including Brightcove, DailyMotion, MetaCafe, blip.tv, Break.com, Howcast, eBaum’s World, Graspr, GrindTV, Sclipo, Webcastr, Viddler, 5min, Streetfire.net and Sevenload -- with more to come soon. TubeMogul says they are in talks with YouTube, who along with Hulu are not among the sites included. So for the first time ever, video publishers can gain access to a single, standardized set of rich, census-based analytics that can be seen and compared in a single dashboard, aggregating data from the Web's top video sites, unlocking rich, standardized data measuring far beyond the metric of video “views,” including per-second audience dropoff, what sites and search terms are referring viewers, audience geography and much more. TubeMogul hopes that this public, census-based data will democratize viewing behavior online far more than the simple metric of video “views,” which are counted on most sites as soon as a video stream starts. These metrics will be free to most of its 85,000 users but commercial sites and ad agencies will have to pay. As TubeMogul indicates, "In a world where panel-based data can yield such wildly divergent numbers, it’s important to have an independent, census-based standard, which we hope to become." Liz Gaines points out that a lack of standard measurement has led to conflicting reports and in light of the recent controversy surrounding the war of numbers between Nielsen and Hulu and the Nielsen-funded Council for Research Excellence's Video Consumer Mapping Study report this past week which stated that online video usage is "vastly overstated" it's clear that TubeMogul has taken a huge step to lead the effort towards standardization. I spoke with Mark Rotblat, VP of Sales and Marketing for TubeMogul back in March and he gave me the scoop on the upcoming release of TubeMogul 2.0. Mark said that TubeMogul 2.0 was always part of their plan and their acquisition on Illumenix helped them acheive their goal of providing a powerful analytics suite for their worldwide customer base. Mark also talked about TubeMogul Marketplace and said that more than anything TubeMogul is a promotion platform. Tim Street shared his 3 reasons why he hates TubeMogul 2.0 and recorded a video with Brett Wilson, CEO and Co-Founder of TubeMogul who describes the exciting news and what it means for independent producers. "In the industry, this level of data was previously only available to large advertisers and top video destinations, and usually only for their own site," comments Brett. "We now track this type of data globally and are giving it away." Michael Greer, VP of Product Development at The Onion, which beta-tested the product says that TubeMogul 2.0, "has allowed us to understand our audience better, as well as to more precisely monitor our business needs." Additionally, Jim Louderback, CEO of Revision3, who has been a strong advocate for honesty and transparency in online video metrics also beta-tested the product, echoed similar feedback, "Knowing which shows are the most engaging to viewers is helpful in selling advertising and devoting resources." TubeMogul is the first online video analytics and distribution company serving publishers large and small who need independent information about video performance on the Internet and automated upload to the Web's top video sharing sites. TubeMogul's analytic technology aggregates video-viewing data from multiple sources to give publishers improved understanding of when, where and how often videos are watched. TubeMogul offers tracking far beyond the traditional metric of video "views." TubeMogul InPlay, which can be activated within minutes, tracks rich viewership metrics such as audience engagement, attention span and site performance -- all in real-time. Founded in 2006 by online video buffs who met while in graduate school and won the UC Berkeley Business Plan Competition, TubeMogul's objective from the start has been to empower online video producers, advertisers and the online video industry by providing publishing tools and insightful, easy to interpret analytics. With TubeMogul, users upload videos once and TubeMogul deploys them to as many of the top video sharing sites the producer chooses. TubeMogul's integrated analytics then provide a single source of metrics on where, when, and how often the videos are viewed. 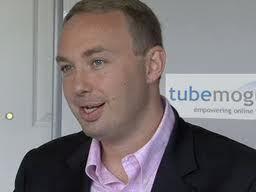 TubeMogul's free beta service has been live since November of 2006. In January 2008, TubeMogul announced the launch of its Premium Products, which include a host of new professional features.